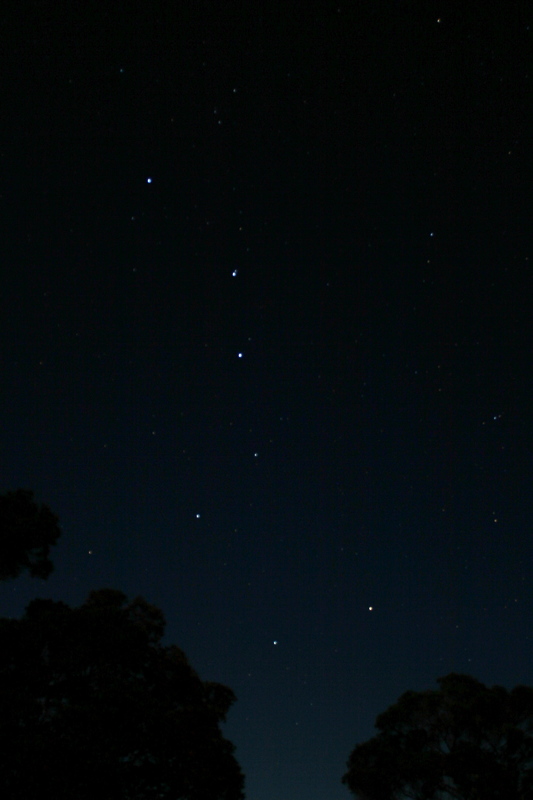 Myth: The “Big Dipper” is a constellation. In fact, the Big Dipper is an asterism. A constellation is an officially recognized group of stars as defined by the International Astronomical Union. Constellations are used to split the celestial sphere into different sections that aid in locating objects in the sky, kind of like landmarks on a map. An asterism, on the other hand, is a popular grouping of stars easily recognized by the casual star observer. Asterisms, which may be part of a recognized constellation, are not constellations themselves. The Big Dipper is one of the most well-known and easily spotted collection of stars in the Northern Hemisphere, and although it is often mistaken to be a constellation, it is merely an asterism. It consists of seven bright stars and is part of the constellation Ursa Major or Great Bear. Although the Big Dipper is not recognized as an official constellation by astronomers’ standards, it played a part in the history of the Underground Railroad. Since the Big Dipper is easy to locate in the sky and because its position remained relatively stable throughout the year, they used the Big Dipper to locate the North Star as they traveled north in search of freedom. Specifically, the two stars at the outer edge of the Big Dipper’s bowl are called the “Pointer Stars”. By locating the Big Dipper in the sky and following the line of the Pointer Stars, you can locate Polaris, also known as the North Star. This usage can be heard in such folk songs as Follow the Drinking Gourd (Drinking Gourd being an alternate name for the Big Dipper). This folk song consisted of numerous coded verses which guided slaves in their journey northward, giving them directions for their escape route. So, even though asterisms like the Big Dipper are not officially constellations, they can at times be just as useful, particularly given that many stars in constellations do not shine brightly and may be difficult to see with the naked eye, making the constellation difficult to spot to the untrained eye. The Big Dipper is a circumpolar asterism, which means it stays above the horizon all night long. At least a portion of the Big Dipper can be seen throughout the night in most parts of North America, Europe, and Asia. Due to the rotation of the Earth, stars seem to shift in the sky over time. If you could track the Big Dipper over a 24-hour period, you would see that it makes a complete circle around the North Star. Today, there are 88 constellations recognized by the International Astronomical Union (IAU). IAU was established in 1919 to “promote and safeguard the science of astronomy in all its aspects through international cooperation.” It is comprised of professional astronomers from all over the world. In the early 20th century, IAU decided to make sense out of the sky overhead by recognizing 88 official constellations based on the location of stars overhead in the northern and southern hemispheres. Constellations are given Latin names of people, animals, or objects as recognized in Greek or Roman mythology. As described above, constellations are used to identify stars in the sky. The naming of individual stars within constellations is based on the system designed by Johann Bayer in 1603. The order of naming stars in a constellation starts with the seeming brightest star and is succeeded by the next brightest, and so on. Each star is labeled with Greek alphabet letters. For instance, the brightest star in a constellation is labeled Alpha, the second brightest star Beta, etc. Of course this system of naming the stars has exceptions and irregularities, so we can consider the system more like guidelines. The Dipper is depicted on the Alaskan state flag. The Big Dipper is known by other names all over the world, depending on the legends and myths surrounding this group of stars within a particular culture. The British know it as The Plow (or Plough) and in western Africa it is called The Drinking Gourd. In other parts of the world, the Big Dipper is not known as a spoon or ladle for drinking, but rather a sort of chariot or wagon as depicted by Ireland’s name for it, “King David’s Chariot” or France’s name, “Great Chariot”. Another name it has been referred to is Charles’ Wain (a wain being a type of wagon). In space, stars move and shift through time, which causes them to grow closer or farther away from other stars. The seven stars we see currently as the Big Dipper only became the discernible shape of a dipper in the last 50,000 years. The stars that make up the Big Dipper are not moving in the same direction, and it is predicted that over time, this beloved asterism will dissolve. The recognizable shape of the Big Dipper will distort and look more like a plow as the top-most pointer star shifts in front of the rest of the asterism and south of its present location.